A leading Southern California chain dating from 1906, the first incarnation of Von’s was sold to MacMarr in 1929; MacMarr was absorbed into Safeway two years later. In 1933, Von der Ahe started another Von’s chain, which wa sthe genesist of the current brand, which lost its apostrophe somewhere along the way. Vons purchased many stores from Safeway in 1988, giving Safeway a stake in the company. Safeway acquired the remainder in 1997; Fresno County is the dividing line between the Safeway and Vons banners, although the actual stores are more or less indistinguishable anyway. Downtown Los Angeles was essentially a small town when Charles Von der Ahe opened his 20-foot wide Groceteria on the corner of 7th and Figueroa in 1906 with $1200 in savings. It was a neighborhood store that catered to the needs of local families, where Von der Ahe pioneered “cash and carry” as an alternative to “charge and Delivery”. 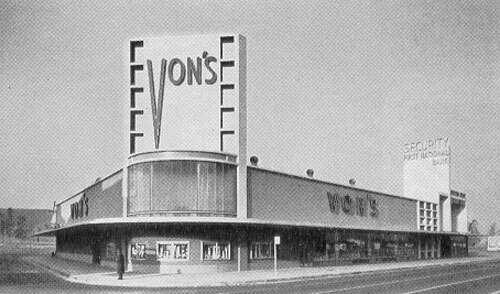 His formula proved so successful that by 1928 Vons had expanded to 87 stores. Charles Von der Ahe sold his chain the following year, but four years later, despite the Depression, two of his sons, Ted and Wil, re-started Vons. Its growth and innovation over the next 70 years was non-stop. In 1948 the brothers opened their most ambitious store at the corner of Santa Barbara and Crenshaw. Thanks to the introduction of pre-packaged perishables, they were able to offer some of the first self-service produce, meat and Deli departments. This milestone marked the advent of the first true supermarkets as we know them today. The most explosive growth occurred during the 1970’s when Vons branched out to 159 stores with 16,000 employees, making it firmly the #1 grocery retailer in Southern California. Today the Vons operation, which includes Pavilions stores, is now a part of the Safeway family of companies. Vons stretches from San Diego to Fresno, from Clark County, Nevada to the Pacific. It’s 325 stores serve millions of Southern Californians and Nevadans.